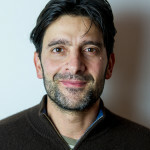 Francesco Fiondella manages IRI’s communications team and oversees the institute’s strategic communications and media relations. He holds masters degrees from Columbia University’s Graduate School of Journalism and the Graduate School of Arts and Sciences, as well as a bachelor of science from Brown University, where he studied environmental science. Fiondella has worked as a science communicator for more than 15 years, using his writing and photography to convey how some of the world’s most vulnerable people struggle with the realities of climate, and what scientists are doing about it. He is especially interested in ways to bring science into the public sphere through collaborations with artists, photographers and other cultural messengers. In 2016, he worked with painter Michelle Rogers to organize IRI’s first visiting artist. He has served as a judge and panelist on “Concorso Cambiamenti Climatici – The Grand Challenge” an international climate-art contest organized by the University of Venice. Fiondella is also the co-creator of the 2014 Climate Models, a crowdfunded project that turned climate scientists into fashion models as a way to spark public engagement and interest in science. In 2014, he helped build a partnership among the International Center of Photography and the Lamont-Doherty Earth Observatory to bring climate scientists into ICP’s gallery space to lead public tours and give presentations about their work. He also spoke about the important role photographers play in communicating science. He is on the advisory board of Planet Forward, an organization dedicated to train the next generation of science storytellers. Before joining Columbia, Fiondella worked as an information graphics editor and staff writer at The Wall Street Journal. Follow him on twitter via @fiondella and @climatesociety. His photography portfolio is here and if this isn’t enough, you can find out more about him on francescofiondella.com.